If you want to change the design and style of your front porch but are unsure where to start, help has arrived. 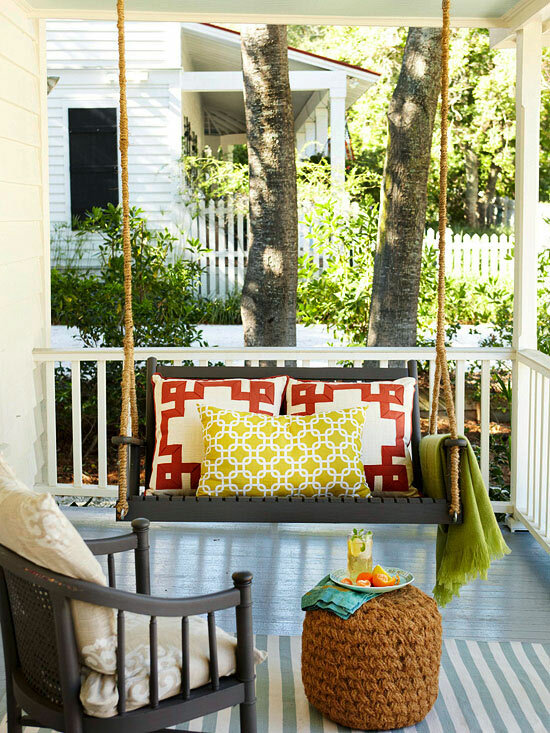 These six surefire strategies take you from start to finish with our best ideas for front porches that are inviting and functional, too. Get a comfy seat. Then add another. To be supremely functional, the best-designed front porches have conversation areas — one seat across from another, some facing out to the yard, some facing in toward the house. But those seats should be relaxing and welcoming, as well as suited to your personal preference. Tip: Unless your front porch is completely protected from the elements, find seating options that are upholstered with weatherproof fabric. Add a table or two. Tables can be loosely defined and easily adapted to items that look good and work well outdoors — overturned crates, for example, benches (which can be adapted for seating), or trunks. A rule of thumb? Every person should have a spot to place a cup or a book. Tip: Measure the tabletop area so you can find a piece that offers enough room for a lamp, plate, and book — common items you might use on a front porch. Lay down a rug. Rugs are truly multifunctional on front porches. They supply welcome relief for feet, as well as pattern and texture. In addition, rugs can be used to indicate a shift in function or zone in a front porch. Options abound in either real or manufactured materials. Tip: Not sure what rug will work in your space? 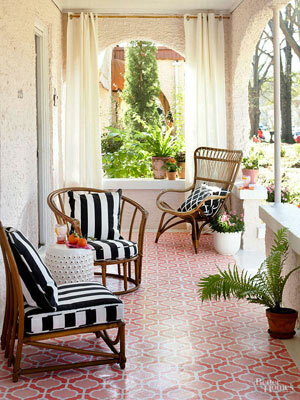 Try painting a design directly onto the floor of the porch for a changeable pop of color. Include storage. One of the best ideas for front porch design and decorating is to include storage. Fortunately, it can be practical and pretty, such as a bookcase that holds candles and a basket or two with extra blankets. Tip: Trays on tabletops are moveable storage options to stash extra items such as a few glasses or plastic pitcher.